Service Rank and Number / Rheng gwasanaeth a rhif: Private No. 17402. 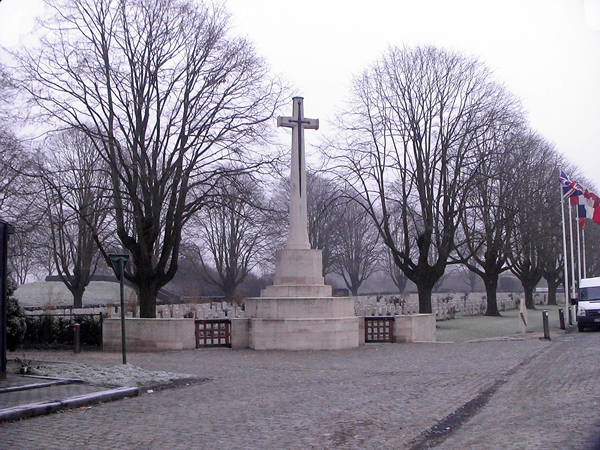 Military Cemetery/Memorial / Fynwent milwrol: Essex Farm Cemetery, West Vlaanderen. Ref No Grave or Memorial / Rhif cyfeirnod bedd: Plot: 11. Row: X. Grave: 2. Killed in action on 7 December 1916, aged 30 years. Joseph Griffiths was born in Rhyl, Flintshire during 1887. The 1911 Census shows that the family lived at 23 Wells Street, Wavertree, Liverpool, England. The head of the family was Joseph Griffiths aged 24, a Plasterer. His wife Jane Ann Griffiths (nee Owen) of Pen-y-Parc Cottage, Penrhynside, Llandudno, North Wales and their son, Joseph Thomas Griffiths aged 2 years. Also living with the family was Joseph’s brother Edward Owen Griffiths aged 30, who was employed as a Brick Setter. In 1915 Joseph enlisted with 13th Battalion, Royal Welsh Fusiliers and on Thursday 2 December 1915 arrived in France with the Battalion. Essex Farm Cemetery, West Vlaanderen, Belgium. On 27 April 1917, a payment of £3.7s.2d was made by the War Office to Jane Ann Griffiths, being monies owed to her husband Joseph. On 6 October 1919, a further payment which is recorded as a War Gratuity of £8.10s.0d was also made to her.